I am happy to say that I am, indeed, still right in the head. But anastrozole is getting a time-out. On May 13 I was sitting quietly and peacefully, meditating, when suddenly I had to grab hold of my chair because I felt as though I were being whirled off of it. A splitting headache and nausea ensued -- bad enough so that I took a basin to bed with me, just in case. Fortunately, I didn't need it. 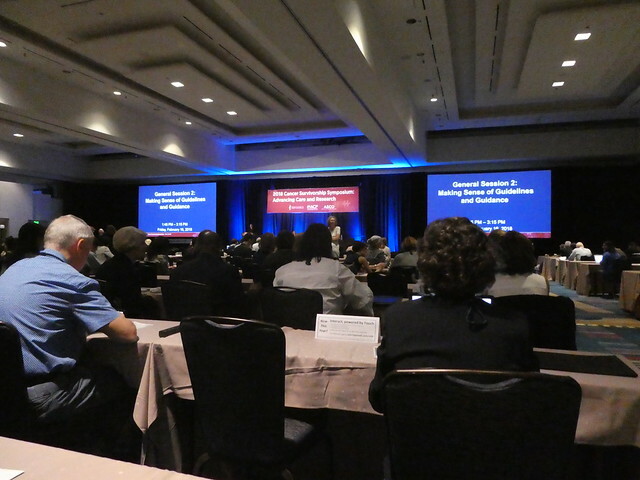 This year marked the third time the American Society of Clinical Oncology (ASCO) held its Cancer Survivorship Symposium. The first two meetings had been held in California. This year the conference came to Orlando: roughly a two-hour drive for me. In January I applied to attend as a patient advocate and got the go-ahead. As I've written here before, I request CDs of my mammogram and other medical images and have done so since 2014, the year I was diagnosed with breast cancer. As I explain in this entry, my slow-growing cancer had been marked for years as "benign" despite the fact that it had been malignant. In fact, marking it as "benign" had been standard of care, and the doctor who finally flagged my tumor as suspicious had gone beyond standard of care. Which tells me that the "standard of care" is unacceptable. As the saying goes, "No news is good news," which is why I haven't written here for a while. I still have good news, but it took some twists and turns and more than a bit of nervousness to get there. On April 11 I was at my desk, minding my own business, when I was whammed by fatigue. As in: I needed to lie down before I fell down. The last time I had felt this way was when I was undergoing chemo -- or, to be more exact, getting Adriamycin/Cytoxan chemo, because Taxol had never hit me like this. A recent thread on the WhatNext.com forums asked if any of us had experienced problems with our teeth during or after cancer treatment. The answers give a tour of dental "collateral damage." After my cancer diagnosis in early 2014 and before beginning chemo, I'd had dental work done. That including extraction of an abscessed tooth that had split down the middle and couldn't be saved. The work concluded with my getting a crown at upper left (I think that's tooth #15, since I've had all of my wisdom teeth removed). I last blogged here about four months ago. Enough was going on -- including the death of a dear friend whom I'd known for 40+ years and the various issues that preceded his passing -- that I opted to take a sabbatical. I've been on a reading jag, which I've been savoring. During chemo two years ago, short reads were about all that I could handle. This is a potpourri, catch-up entry. My partner has a saying: "When in doubt, overdo it." Over the past few years, she has slowly been backing away from that habit. As someone with MS, it's hard on her. As her caregiver, it's hard on me. As her caregiver and a cancer patient, it's become that much harder on me. April 13 will mark three months that I've been on Xarelto. My GP tells me that I can stop taking the blood thinner at that time. 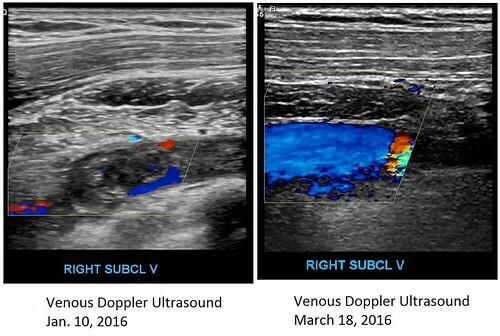 Then, some months after that, we can do another follow-up ultrasound. It takes time for the clot to clear completely, she said. I still feel some very minor discomfort around my jugular vein when I yawn. It feels like a mild version of the discomfort I had felt after my port had first been inserted. My scar from the port removal continues to heal and my surgical skin remains in place. I still have a bit of venous swelling in my right arm. I had my follow-up ultrasound on March 18 for my port-related blood clot. The upshot: My subclavian vein is still partially blocked, but it is well on its way to being fully open again. Insurance rep: Why did you pay [the hospital]? Me: Well, when you're flat on your back in an ER triage bed with a blood clot that could kill you, and someone from the hospital is standing over you asking for money, that could be a bit of a motivator.